Death Knell for Brazilian Democracy? Image Caption: Far-right Brazilian presidential candidate Jair Bolsonaro’s campaign is remarkably popular among the electorate, but it has at times evoked memories of Brazil’s former military dictatorship. The first election since the corruption scandals of former Presidents Dilma Rousseff and Michel Temer could prove deadly for Brazilian democracy. Last Sunday, Jair Bolsonaro, a far-right candidate running on a platform of increased security, received the lion’s share of the first round of voting for president – 46%. The second-place candidate, Fernando Heddad of the Worker’s Party, received 29%. Bolsonaro’s candidacy is notable for many reasons: his misogynist, racist, and homophobic comments; his party’s stunning rise to power; his stabbing last month at a rally; or his adroit use of social media. However, what is arguably most disturbing about Bolsonaro’s popularity is his frequent apologism for Brazil’s mid-century military dictatorship. From 1964 to 1985, Brazil was defined by bloodshed and a static power structure; a notoriously brutal military dictatorship murdered thousands and “disappeared” even greater numbers. This period represented a four-decade void for an official left-wing party in power in Brazil; Lula da Silva, who served from 2003 to 2011, is considered the first truly left-wing president of Brazil since 1964. In the decades immediately following the end of the military dictatorship, its shadow loomed over Brazil as taboo. While the newly-formed Constituent Assembly passed a Constitution in 1988 restoring civil rights and liberties such as free speech, direct elections, and independent prosecutors, the public’s attitude towards past atrocities was one of deliberate forgetfulness. The 1979 Amnesty Law protected both military figures and left-wing guerillas from prosecution for their crimes during the regime and institutionalized a preset narrative of the period by elevating certain military testimonies. Most large-scale Brazilian media that had supported the regime’s censorship, such as Rede Globo, continued into the post-military world. Regardless, overt military participation in Brazilian democracy was deeply unpopular in the 1980s and 1990s. During the period of the military’s lowest reputation, Jair Bolsonaro cut his teeth as an Army captain and outspoken political force. In 1987, as Brazil’s first civilian government rose to power, dissatisfaction among the ranks of mid-level Army officials rose with it as they suffered from decreasing wages and diminishing status in the Brazilian political hierarchy. Bolsonaro capitalized on this anger by first writing articles denouncing their superiors (leading to his brief arrest) and later with more insidious intention. At the time, Veja magazine reported off-the-record comments with Bolsonaro about a bomb threat at the Military Academy in Resende. 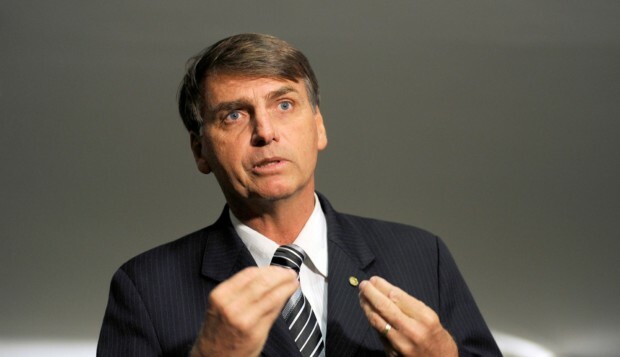 Bolsonaro boasted of his involvement in this planned attack; in his words, “we talk, and they do not solve anything; now the people are exploring more sensitive points.” These actions made him a darling of middle-class military families in Brazil, whose disenchantment with both civilian rule and its acceptance by the military establishment had been growing. To this day, Bolsonaro makes no effort to hide his embrace of the Brazilian military. In a move unprecedented since the military dictatorship, a former army general is on a Brazilian presidential ticket: General Hamilton Mouraõ, Bolsonaro’s running mate. Mouraõ’s position on military intervention is no less radical than Bolsonaro’s, stating last year that the military could impose order if the judiciary “didn’t solve the political problem” of corruption. Their appreciation of the military is reciprocated; General Villas Boas, Chief of the Armed Forces, has threatened to intervene if Haddad wins. The resurgence of a military presence in Brazilian politics is not as sudden as it seems. Michel Temer, the outgoing president (and the least popular leader in modern history), ushered in its rise in several ways. Last June, Temer broke precedent by appointing a general to the office of defense minister, the first time a civilian has not held the office since its creation in 1999. Temer’s decision to militarize Rio de Janeiro was even more pivotal. After an unmitigated rise in street crime and drug violence in Rio last February, Temer put Brazilian military in direct control of city security—another first for Brazil since the military regime. Local activists opposed the move, drawing a parallel between it and a more limited intervention in the Maré favela in 2015, which ended with even more gang violence. Similarly, the military’s control of Rio has not prevented a rise in homicides of up to 35% in some areas. Will Brazil heed the call to protect its democracy? Like many democracies that have suffered setbacks in recent years—Hungary, Poland, the Philippines—Brazil is relatively young. Its democratic culture and institutions have had barely three decades to grow. Many of Bolsonaro’s supporters are of a generation too young to remember the worst atrocities of the dictatorship. And seemingly endless corruption scandals have eroded the public’s faith in a fair and efficient democratic system—only 13% of Brazilians registered support for democracy last year. In a search to elect legitimacy, the public may reject a candidate with ties to the corrosive party politics of the past decade in favor of one with ties to an older—if more insidious—tradition. Rebecca J. Atencio. Memory’s Turn: Reckoning with Dictatorship in Brazil. ← USMCA: Total Overhaul or NAFTA 2.0?